I ALWAYS have LOADS of double layouts to do (way too many photos to choose from) so it was great to see a sketch challenge which would allow me to complete one! These photos were taken on a day out to Chessington World of Adventures back in October 2014. Great double layout....I am not good at doubles!! Well done!! Great take on the sketch. 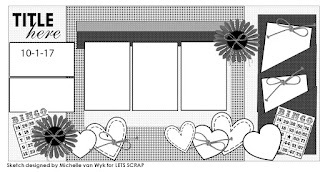 Thanks for joining us at Let's Scrap! Great to have you play along with us at Let's Scrap Sketches and to get another layout completed! right?! !